Scythe's 60mm Mini Kaze is designed to replace any 12V 60mm 2-pin or 3-pin fan, whilst making only a fraction of the noise. 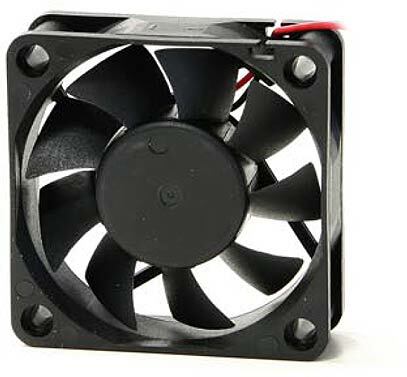 Scythe's 60mm Mini Kaze is designed to replace any other 12V 60mm fan, whilst making only a fraction of the noise. The Silent Mini Kaze 60mm fan comes with a 2-pin connector. Included with the fan is an adapter to convert the 2-pin connector to a standard 3-pin connector, thus providing the best compatibility for both old and new hardware. Note: This fan is supplied with mounting bolts and not self-tapping screws. I needed this to cool my 780i bridge, this little fan is brilliant, it is quiet. I can't hear it over my other fans, which are Zalmans and an akasa apache. The fan moves a lot of air especially for how quiet it is. Also FANTASTIC service from quiet PC, I order this yesterday and I received it just this minute with standard p+p. 10/10 for service from quiet pc, 9/10 for product it isn't COMPLETELY silent but almost is (I'm just a silence freak). If you have a resistor to connect in-between the cables (like a Zalman RC56) it is silent.